The creatine kinase (CK) system is the final step in cardiac energy metabolism providing a direct link between energy production in the mitochondria and energy utilising ATPases. It acts as an energy storage and transport mechanism and maintains favourable local ATP/ADP ratios, thereby supporting further energy production and high levels of free energy from ATP hydrolysis. Down-regulation of CK activity and myocardial creatine levels is a universal finding in chronic heart failure, and the degree of impairment has been shown to be an excellent prognostic indicator in patients. However, it is unclear whether these changes represent epiphenomenon or contribute to disease pathophysiology. This chapter focuses on attempts over the past 20 years to address this question using genetic loss-of-function models in the mouse. 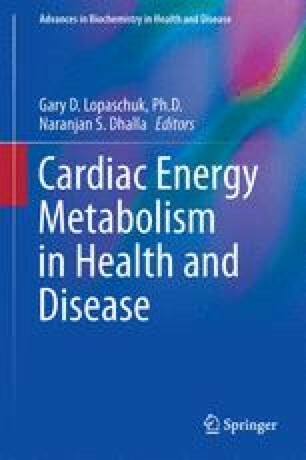 Findings from these models have been equivocal and at times contradictory, however, recent evidence suggests that loss of creatine or CK is not detrimental in surgical models of chronic heart failure, providing the clearest evidence to date that such changes do not contribute to dysfunction. Despite this conclusion, over-expression of CK in mouse heart has been found to protect against heart failure and improve survival. In the setting of ischaemia-reperfusion injury, loss of creatine or CK impairs functional recovery and augmentation of either is cardioprotective. We are therefore entering an exciting new era of research in this field aimed at understanding the benefits of CK system augmentation and identifying new mechanisms to achieve this without genetic modification for possible future clinical translation. Work in the authors’ laboratory is funded by the British Heart Foundation (Programme grant RG/13/8/30266).